Not our photo. Many elaborate beaded dresses such as this are worn during special occasion by Moroccan women. Often we westerners have the perception that women in male dominated countries are unhappy, making every effort to change their status. Always curious as to the culture in foreign lands, we've taken special care in observing gender roles in the past two months we've spent in Marrakech, Morocco. Please keep in mind that our comments here today are observational, not so much opinions on how or why it could or should be different. Nor are our comments intended as a "soap box" to vent personal feelings or frustrations over the lack of equality in our home country; equal pay for men and women in the workplace, equal job opportunities in government and the corporate world...la la la...It could go on and on. But, I won't. That's not the intent of our daily conversations. Not our photo. 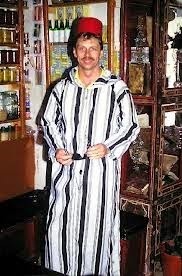 These typical Moroccan dresses are actually caftan style, very loose and unfitted. The vendors pin them in the back to make them appear to be fitted to the body. Instead, we prefer to share the observations we've made in our extended stay in Marrakech, in a highly traditional lifestyle, of a highly traditional culture, embedded in Islamic customs, as alive today as it may have been hundreds of years ago. We neither criticize nor extol the virtues of an Islamic life and the gender roles clearly defined as one wanders through the souks and the Big Square of the Medina. The differential of roles is clearly illustrated in a single foray through the Medina, let alone our almost daily outings. Men work the shops in the souks. On only a few occasions, have we seen women sitting on the little stool awaiting customers. Our perception was that they were filling in for an otherwise preoccupied male owner or manager, due to illness or other reasons. Men are the servers in restaurants while women are the hostess or cashier. Men are the cooks/chefs in restaurants. With my way of eating we've met many cooks, all male. Women predominate in the pharmacies and grocery stores. Men predominate in the clothing and shoe shops, both in the souks, the Medina and outside the Medina, including in women's fashion shops. Women are housekeepers and household cooks while the men handle money and side tasks, such as is the case with Samir and Adil. Oumaima and Madame Zahra perform housekeeping tasks, cleaning, laundry, food. If a light bulb needs to be replaced, it is Adil who attends to this task. 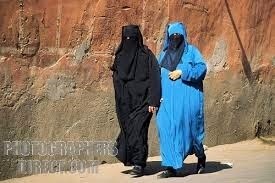 Modern young women wear traditional western attire while others maintain modesty keeping arms, legs and heads covered. The age of the women underneath the traditional abaya may vary. But many women wear the djellaba, a long loose hooded caftan with sleeves, often colorful with patterns. Unable to determine the age, one expects that the fully covered women are married, about to be married and more mature. Modern young men dress in stylish dress pants and pressed shirts, seldom wearing jeans when working. Older or more traditional young men wear the traditional garb, the djellaba. In either case, they appear well dressed with attention to detail. The roles for women are firmly entrenched in history and tradition. Young women stay with the family until marriage which is often arranged. Women are brought up to hold marriage and family as their life's goal. Although education and working outside the home is becoming more common. Although we've seen many men in groups commiserating over tea in cafes, we have never seen traditionally dressed Muslim women gathering in restaurants or cafes. Typically, women are not allowed to go out alone at night, although men do. (Muslims do not drink alcohol which we'll be writing about tomorrow and how it may affect a tourist while in Morocco). Of course, there are many more details of gender roles in Morocco. But, in our time here, we've had little opportunity to interview or discuss these sensitive matters with local women. This well written article and more offer additional details of life for men and women in Morocco. if often seen in Morocco. An important factor we've observed is when a question or issue manifests, the response is directed to me, not Tom. For example, when we do visit a shop, even if looking at a male orientated product, all the conversation is with me. Our perception is that, although many of these traditions are well established, women are held in high regard as decision makers when it comes to shopping. Not our photo. This is another commonly seen style of djellaba. Moroccan women do not exude a sense of discontentment with their status, although most certainly, women in every country may feel suppressed and undermined. There is a general demeanor in Marrakech of acceptance and contentment of the defined roles for both men and women. Not our photo. It is fairly common to see women fully covered with only slits for the eyes. Oddly, after reviewing the above ten points, we realized that many of these prevail in other countries including our own. The world is a long way from equality. It is often culture and tradition that play vital roles in preventing the stance and opportunity to prevail in most societies. Male and female roles are often driven by our DNA. Observing animals in the wild for a full three months, the definition of these roles were clearly evident in their behavior in everyday life. It wasn't until later in 2013 that we posted photos almost everyday as we do now with a few rare exceptions. As a result, this photo from an earlier date while we were aboard the Norwegian Epic. On most long cruises, the ship's captain and other officers conduct a meeting for the passengers explaining the operations and management of the ship. After having been on several cruises, we'd lost interest in attending these meeting, taking this photo as we leaned over the railing on an upper floor. For the story for April 27, 2013, please click here.